Darrell Rigby, Frederick F. Reichheld & Phil Schefter suggest: “CRM aligns business processes with customer strategies to build customer loyalty and increase profits over time.” Rigby et al. (2002). In practice customer relationship management (CRM) software is a tool used to better manage interactions between a company, its customers, suppliers and leads. 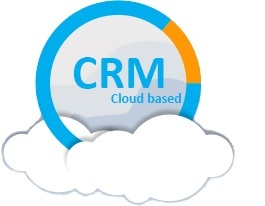 Modern CRM software offers further capabilities such as automated sales activities, forecasting and pipeline management. As interactions take place within one area, reports can easily be created to show predictions within the sales pipeline. Allowing easier budgeting and capacity planning. Due to the mobile and cloud nature of many modern CRM tools, field sales teams can now easily find information such as: Customer addresses, geographically near opportunities and new available leads. With integration’s such as Hubspot, marketers can create and modify marketing campaigns without ever having to leave their CRM. Since marketing efforts are now tied into their lead management tool (CRM) return on investment visibility opens up allowing marketers to understand (often for the first time) which marketing channels are losing the company money and which are increasing turnover. By having a clear view of customer information, your customer services team can rapidly see a complete picture of a customer such as billing, emails and technical issues. This opens the door for a more holistic approach to customer services. Businesses often find themselves with multiple sets of data held in different places such as spreadsheets, sales tools and customer service logs. By reducing these “data islands” into one area, data is found more easily and productivity is maximised. This also allows management teams to quickly see what activities team members have completed/are planned, schedule in future activities and rapidly identify top performers. How did CRM systems originate? Starting out as not much more than a computerised rolodex, CRM systems started in the 1980s, pioneered by Robert and Kate Kestnbaum, the original CRM systems used statistical databases to manage and analyse customer information. During the late 1980s, ACT! and Goldmine both entered the arena releasing contract management software, however it wasn’t until the early 1990s that the acronym and development of ‘CRM’ really took off. Inspired by an internal sales system Oracle used, ex-Oracle employee Tom Siebel left to produce Siebel Systems (later acquired by Oracle), which rapidly became the leading Sales Force automation market provider. During the late 1990’s CRM development sped up with the addition of marketing, sales and customer service tools being wrapped into one tool. Cloud technologies began to take form in the early 2000s as another ex-Oracle employee (Mark Benioff) developed the first major SaaS CRM called Salesforce. Although initially ignored, Salesforce quickly became the main CRM player in the 2000s. It was also in this decade that Workbooks CRM was released (2008). Created by a team of ex Salesforce users, Workbooks CRM was developed to deal with the frustrations they found using the Salesforce system. Workbooks CRM took CRM to a new level, offering new CRM features such as lead tracking (from advert to invoice) and the ability to create custom scripts (using .PHP) to automate many of the admin tasks we come across everyday. Workbooks CRM continues to go from strength to strength with over 50% growth year on year. Software as a service (SaaS) is rapidly becoming the CRM de facto as consumers see the benefits of accessing data anywhere and anytime. More and more CRM software companies are shifting their software from a traditional ‘download before you can use’ approach to the clean, quick, and instantly accessible CRM SaaS offers. Benefits include the ability to switch on/off user licences (such as when an employee leaves/joins) and a pay per user approach. Who buys CRM software – do I need to be a large organisation? Although CRM software is typically thought of as a sales tool, it’s now used and implemented by any business looking to work more productively, our customers range from charities to advertising agencies. We’re personally finding a greater range of businesses signing up year on year. Whilst historically only large businesses have been seen using CRM, we’re beginning to see more and more small and medium sized businesses implementing CRM software to gain the benefits this offers. Many niche providers cater solely for this market. Which business departments would use a CRM tool? Since CRM software creates a single data island across an entire organisation, businesses often find their CRM software is adopted company wide. Internally every area of our business uses our CRM tool on a daily basis. Support tickets are raised in the system, Finance automatically send out invoice reminders, sales track and view new opportunities whilst marketing track their latest promotions ROI. Furthermore a joined up approach across an entire organisation both encourages a successful integration and multiplies the benefits a CRM provides. How can we ensure a successful implementation? Purchasing and implementing software of any type does not come without challenges. If your colleagues don’t adopt a new piece of software, no matter the benefits, it will be seen as a burden and expense. So how can you be sure your company adopts a CRM? Join the successful 25% and sign up for a free 30 day trial. SaaS businesses often have a sales length of over six months, making tracking marketing using tools such as Google Analytics extremely difficult. Since Workbooks ties in multiple business areas it’s easy to track leads from creation (i.e. clicking on a Google ad) to the point a paid invoice is received – even if this process spans across a year. This allows full visibility on marketing ROI. Another benefit of a multi-departmental approach is automation such as: triggering invoice reminder emails, sending overdue sales leads reports and the creation of renewal orders. Data is hosted in the cloud meaning you can access it anywhere in the world. With all our data being held and backed up in UK data centres, your data never leaves the UK. We tie an agreement into every contract offering a guaranteed uptime of 99.5%. We’re not too concerned though, our current uptime is 99.9%. We enjoy a long term relationship with our customers so we’re able to offer an extremely competitive pricing – Currently we’re 50-70% cheaper than the market leader. We pride ourselves of being the only CRM to offer automation, marketing trackability, cloud based UK held data and an SLA agreement. For a free trial or demo please contact us. Established in 1973, Megatech are the largest supplier of equipment and services to thin film and semiconductor industries in the UK. Before adopting Workbooks, Megatech’s Marketing department used Salesforce.com whilst their accounting team used Sage Line 50, and further departments including customer services used completely different systems. This meant the transfer of information between departments could be slow and inefficient. The team now realised they needed a CRM package which would allow them to streamline communication throughout the organisation, narrowing their search down to three providers including Workbooks and NetSuite. Finally choosing Workbooks because “In terms of price, functionality and support Workbooks came out on top,” explains Quentin, “We liked the fact that managing products and pricing schemes was easy, and that the system was designed to be flexible to allow for customisation. Today Megatech have a single system which manages the entire sales process from prospect all the way to cash. “What I love about Workbooks is that it has knocked down the barriers that we were experiencing between teams and has given us a connected view of all of our data and our customer engagement,” explains Quentin, “We have better visibility of what is in our pipeline and we can now produce quotations, orders and invoices from the same system. Despite popular belief the benefits CRM’s provide span further than simply providing a contact database, with features such as automation, lead tracking, case handling and sales pipeline management, more and more businesses are switching from multiple ‘data islands’ to a single system. Developed from not much more than an electronic database CRM software is continuing to shift to cloud based, multi-functional software. How can I find out more about your CRM software? At Workbooks, we don’t just sell you CRM Software, we sell you an ongoing, fully supported service. However we only work with companies which meet our strict criteria. Discover more by signing up for a 30 day trial, or contact us for a demonstration. Before you purchase a CRM ensure you get all future users involved and committed to the project, this way by the time your new CRM rolls out your colleagues will already know about the product, what it does and how it benefits them. Forget about features, how will your new CRM actually benefit you? Suggesting colleagues admin time could be reduced by 90% is a lot more attractive, than pushing automation features. By having a CRM provider which hosts data in the cloud, users can access the system from anywhere, such as a team member logging in via a mobile during a sales call. A browser based CRM, means users don’t waste time downloading heavy software (which may only work on a single computer) or even worse waste a morning waiting for ‘critical updates’. A browser based CRM such as Workbooks means you can log in and begin working from any computer or mobile device anywhere, within seconds. Workbooks is modelled on a Windows desktop, for example we have a start bar and windows – this means users intuitively know what they’re doing. Due to Workbooks CRM extremely competitive pricing, it takes us over fifteen months to generate a profit on our customers, and this means without a successful implementation we will lose money. So we work hard for a shared successful implementation. By working directly (rather than through a reseller) you can ensure you’re not lost in the noise. Why have I never heard of Workbooks? Workbooks is a growing company (up to 50% growth year on year since our creation in 2007). Since it takes us 15 months to generate a profit on a new user we’re busy making our product the best possible experience. Workbooks won CRM Wars in May 2014 ahead of 31 other CRM vendors as voted by customers. 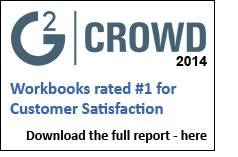 Workbooks in 2014 was rated #1 CRM for customer satisfaction by G2 Crowd. Workbooks was recognised with an award for Most Innovative Cloud Best Practice by Channel Partners in 2014. Workbooks was endorsed both in 2014 by being shortlisted as a finalist in the Eurocloud awards. Who are Workbooks current customers? As mentioned earlier, our customers span from charities to advertising agencies. Take a look at our customer page to learn more. Join the future of cloud based CRM by signing up for a – 30 day Free Trial. Not quite ready but want to see a demo? Contact us – here.